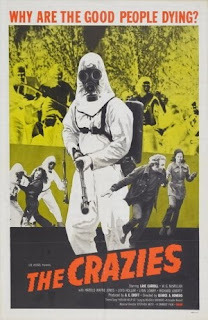 The new horror flick The Crazies looked intriguing, so I decided to check out the 1973 original. Well, they're going to have to do a doozy of a job with the remake to save this stinker from the heap. The movie is, in all fairness, kind of fixating. But with the expectations of it being a George Romero film (writer and director of Night of the Living Dead, Dawn of the Dead, and The Silence of the Lambs), this one feels mostly like a misstep. For a film called The Crazies, there needs to be lots of psychological mayhem, and there is hardly any. There is a cool ex-Green Beret who battles his way through a Pennsylvania town where the water supply has been badly contaminated by a military mistake. Residents are rounded up amid numerous shoot-outs against B-movie (or maybe C-movie) stormtroopers. The anti-climactic ending is just another groan-inducing moment. Cinema goers stayed away when this stinker first hit the movies, and you should do the same thing now. What Should We Do About Oil Spills? Will Ferrell Writes the History Book on George W.